ConfigurationDesk supports you with precompiling containers for Simulink® models and Functional Mock-up Units (FMUs). This means you can pass on models without the source files, thus protecting your intellectual property and simplifying model exchange. In addition, you can save build time, because once a precompiled container is generated, it can be reused in different projects or variants, without having to generate and compile the C code again. The latest version of ConfigurationDesk supports the computation of multiple simulation models on one processor core. It also supports new I/O functions that facilitate Ethernet data transmission via the TCP and UDP protocols, for example. ConfigurationDesk supports the open Functional Mock-up Interface (FMI) standard. This enables the users to use different modeling approaches (e.g., based on physical modeling with Modelica) by using Functional Mock-up Units (FMUs). 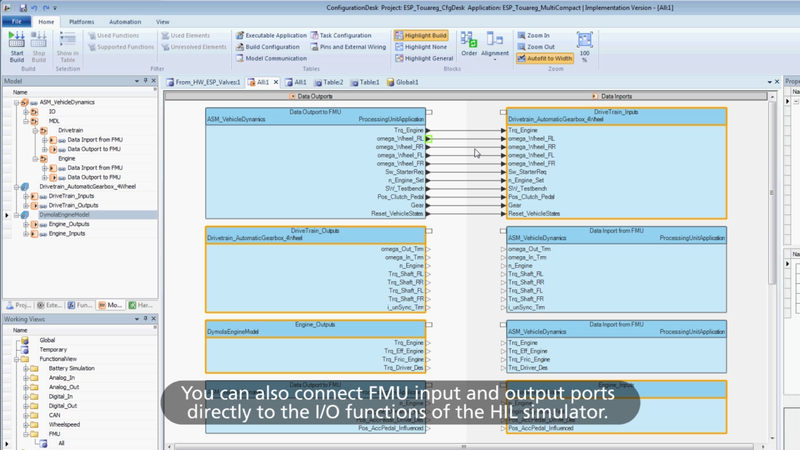 In HIL projects, FMUs can be integrated together with Simulink® models. The user workflow for importing and connecting FMUs to other model interfaces and to I/O is identical to the workflow for Simulink® models. 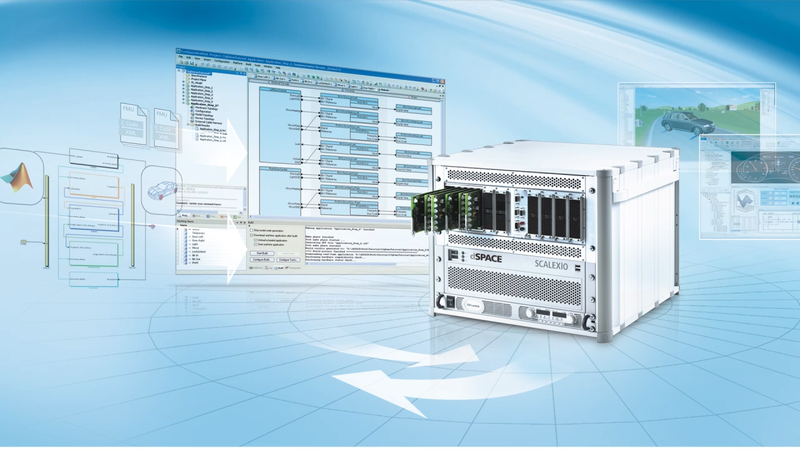 Product demonstration of how to integrate virtual ECUs on the HIL simulation system SCALEXIO® by using ConfigurationDesk. Product demonstration of how to integrate Functional Mock-up Units into an existing model by using ConfigurationDesk. 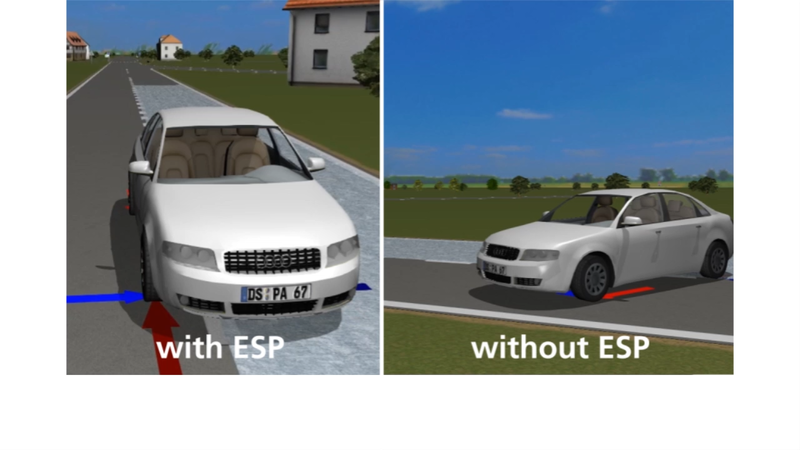 Product demonstration of how to simulate virtual ECUs on the HIL simulation system SCALEXIO. How to integrate functional mock-up units from different vendors into one simulation application. How to integrate functional mock-up units into an existing model. How to reuse an existing ControlDesk project for a new simulation scenario. How to visualize a simulation run for comparing different test scenarios. ConfigurationDesk is an intuitive, graphical configuration and implementation tool for SCALEXIO hardware. With this software, you can connect your behavior models from MATLAB®/Simulink®/Simulink Coder™ to I/O functions, for example, configure the SCALEXIO hardware, and control the whole process for generation the real-time code. 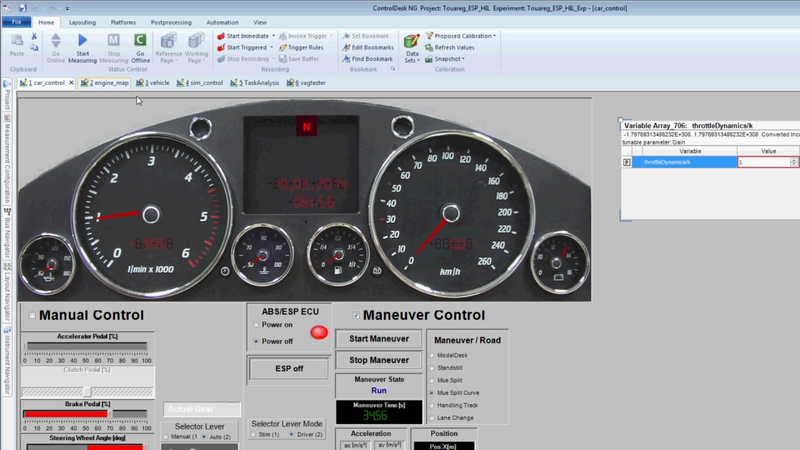 You can optionally define and document external devices such as ECUs and loads, including their signal properties (descriptions, electrical properties, failure simulation settings, and load settings). ConfigurationDesk offers different views on the configured system. It is possible to display the signal path between the ECU pins/load pins and the behavior model. 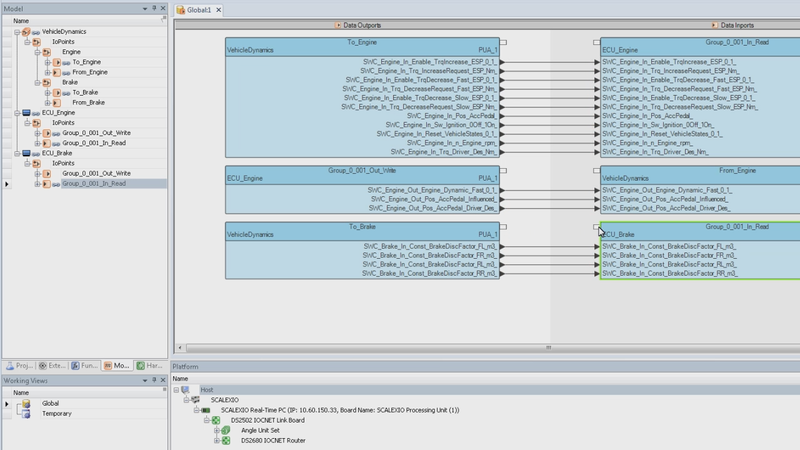 In other views, you can directly add the I/O functionality to the model hierarchy and propagate interface changes to the connected MATLAB® Simulink® model. With ConfigurationDesk, you can easily implement the behavior model code and the I/O function code from ConfigurationDesk on the dSPACE SCALEXIO hardware. The entire build process for a real-time application is handled by ConfigurationDesk. Besides being able to interactively work with MATLAB Simulink models, you can import previously generated C code from different modeling tools, such as code from the Simulink Coder via Simulink Implementation Containers (SICs) or code from other modeling tools via Functional Mock-up Units (FMUs). Comprehensive documentation options and graphical displays give you great project transparency. You can assemble and configure the project-specific hardware offline as a virtual system, in other words, as a purely software-based configuration. A real-time application can be executed for test runs even if parts of the necessary and configured I/O hardware are not physically available. In addition, there are options to generate a Microsoft® Excel® file with information on the wiring harness and on external devices. The new ConfigurationDesk navigation bar offers task-specific view sets that are optimized for the chosen workflow. Each view displays only the functions required for the respective task. If needed, you can switch between the views while working. Besides being able to interactively work with MATLAB Simulink models, you can import already generated C code via Simulink Implementation Containers (SICs) or code from other modeling tools via Functional Mock-up Units (FMUs). Using model containers reduces external dependencies, because no model tool installation is required to use the models. It also simplifies the exchange and re-use of models, because it saves code generation and build time. SICs are ZIP containers that include the C code and other artifacts, such as precompiled libraries and a model interface description. ConfigurationDesk provides a method to convert SIC files with source files into SIC files without readable source files but with a SCALEXIO-compatible library file, which might be desirable for protecting your intellectual property. Once the SICs are generated, they can be reused in different projects, without having to generate the C code or library again, thus saving build time. FMUs enable you to use different modeling approaches, for example, based on physical modeling with Modelica. In ConfigurationDesk, FMUs can be integrated together with Simulink® models. You can also use precomplied FMU files, thus saving build time and protecting your intellectual property. The user workflow for importing and connecting FMUs to other model interfaces and to I/O is identical to the workflow for SICs. The Model-Function page is optimized for Simulink-oriented work with projects for which the Simulink model interface still has to be adapted or changed. The Signal Chain page is optimized for container-oriented work with projects for which the model interfaces are already fixed. To make exchanging simulation models easy, dSPACE offers a Model Interface Package for Simulink® (MIPS) for generating Simulink implementation container (SIC) files. With the free-of-charge MIPS, modeling experts can generate the (C code) SIC file with Simulink Coder, without needing a VEOS or ConfigurationDesk license. Out of their Simulink models and together with dSPACE Run-Time Target, they can generate code and create ZIP files that contain all the necessary code and artifacts for executing the models on different simulation platforms, such as VEOS and SCALEXIO. Model integrators using SIC files do not have to generate code again for building the simulation. Using SICs therefore significantly reduces the amount of time needed for reusing the SICs in different projects. Integrate FMUs together with Simulink® models. CAN and LIN signals can be configured either with the Bus Manager or with the RTI CAN MultiMessage Blockset and the RTI LIN MultiMessage Blockset. FlexRay nodes are configured with the dSPACE FlexRay Configuration Package. Ethernet UDP/TCP ist supported by dedicated function blocks in ConfigurationDesk. Ethernet SOME/IP ist supported by the Ethernet Configuration Package. Large, complex models can be distributed across multiple processing units, processor boards, and processor cores to ensure the simulation runs in real time. Two different workflows are possible for this. The first is to use separate behavior models for each core and import them into ConfigurationDesk. The intermodel communication in this workflow is configured in ConfigurationDesk. If you are working with more than one model, ConfigurationDesk provides the Multiple Models view set. In the second workflow, there is one overall Simulink® model for the entire application, and a special Simulink block is used to specify which of the subsystems are to be computed together on one core. The overall model is then automatically split into separate model files. The intermodel communication in this workflow is transferred from Simulink® to ConfigurationDesk. Multiple models can be combined to one process. Multiple processes can be assigned to processing unit applications in ConfigurationDesk, which automatically performs the core-to-process assignment within each unit. ConfigurationDesk supports two approaches for working with Simulink models. Besides the direct import of MDL files (which allows automatically starting the Simulink Coder from the ConfigurationDesk build process), now an alternative workflow for using Simulink models is supported. Here, Simulink implementation containers (SICs) are generated by using the Simulink Coder in a first step. These SICs contain the model C code and other artifacts, such as precompiled libraries and a model interface description. Once these SICs are generated, they can be imported in different ConfigurationDesk projects. Thus, to save time, they can be reused for different projects or variants, without having to generate the model code again.